Avon couldn't sleep. He had too much to think about. Where is Liberator? What game is the Patrol playing? It all had to be part of a ruse. Why is this family sheltering us? And what, exactly, had happened to Cally today? From Marian's description it was just another instance of Cally being done in by her erratic psi abilities, but Barram's peculiar communications problems happened at the same time and perhaps it wasn't just a coincidence. While he was thinking, he was also prowling around, quietly, in bare feet, further familiarizing himself with the house and grounds. When he got back to the house the light was on in Cally's room. He decided it was a good opportunity to speak to her in private. Her door was ajar and he only tapped on it lightly, calling, "Cally?" before he looked in. "How are you?" She smiled. She was sitting up in bed, reading. He noticed a slight puffiness, a bit of shadow under her eyes. "Well enough," she said laying aside the book. "I'm just all slept-out for now. What are you doing prowling about at this hour?" "Unlike you, I haven't been able to sleep. It's a habit I have. What in the world is this?" he asked reaching for the book. "A real book-- with pages. Marian has hundreds of them. Look." She nodded at the wall which was floor to ceiling bookshelves overloaded with books. "Can you believe it? If only they didn't take up so much space." He hadn't noticed the books before: they had been hidden by a curtain. "I haven't held a book in-- I don't know when," he said as he took in the feel of the thing, riffling through the pages, enjoying the look of the printed words. Closing the book, he noticed the colourfully gaudy picture on the cover and after a moment he deciphered the artistically rendered title. "What's this? 'Daughter of the Revolution'! How can you read this stuff?" "We all need to escape from reality sometimes." "Do we? It's inescapable. It all catches up with us in the end," he said, turning the book over, scanning the plot synopsis on the back cover. After a moment he laughed. "I was wrong. Here is escape from reality indeed! Listen to this-- "
"It's just a book-- " He wasn't looking at her, so he didn't notice the rueful expression on her face. "Listen: 'Twenty-five years ago,'" he read dramatically, "'the last of the organized resistance had been crushed, its forces scattered and driven into hiding. But then, from among the children of those hopeless and defeated resistance fighters there arose a new leader, one whose vision, courage, and determination would reignite the spirit of Rebellion-- ' Have you been taking notes?" he asked, looking up to find that instead of sharing the joke, all the light had left her face and she had become withdrawn. Cally looked away and Avon cursed silently. He knew she was just trying to find a respite, relief from too many hurts until she could regain her strength, but at the same time he resented her overly sensitive reaction to his joke. Casting about for something to divert her, he noticed a robe on the foot of the bed. Tossing it to her he said, "Here, put this on and come for a walk in the garden. You need some fresh air. We'll talk." Cally put the robe on, but she seemed to be in a fog. She was halfway out the door before she realized something. "I haven't any slippers," she said looking down at her bare feet. 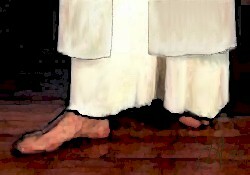 "Neither have I," he said, drawing attention to his own bare feet. "Come on. I've already been out. You won't need them." Grasping her elbow he firmly propelled her outside. It was a warm, clear night and the fragrances of Marian's flower beds were fresh and sweet. The grass felt cool. They walked in silence for a while, following the path to the lake where Cally stopped and stood gazing out across the water for the longest time. Avon was watching her profile intently, wondering if he should awaken Marian, when, finally, Cally said, "It's a beautiful night, isn't it?" "Yes, it is." He waited patiently, sensing that she was still on her way back from somewhere. She continued gazing out across the water, but now he could hear her breathing more deeply. "You're right, it isn't reality I'm running from. It's just plain, everyday, wearing, hurt and uncertainty." "I know... I'm not the only one who has lost a home and family. You have losses, too... and Tarrant... Vila? Dayna has lost every bit as much as I have, but... she's only twenty. If I were twenty again-- "
"If you were twenty, what then?" "Oh, Avon! When I was twenty I was immortal-- eternally young. Life stretched out before me, shining and full of adventure. I was fearless then and full of conviction. Everything in life was so clear. I knew exactly what was right and what was wrong-- no gray areas for me! And I was convinced that if I just pushed hard enough I could right all the wrongs in the universe. Everything would work out happily. I hadn't any idea what life was really going to be like..."
"No. But we all had hope. We had faith in the future. If I were twenty again, perhaps I could believe that someday-- I don't know." They walked on in silence, barefoot in the dewy grass, until the subtle wind stole the warmth from the night. Cally shivered reminding Avon suddenly that she was still recovering from the hysterical outburst. There were questions he wanted to ask her, but they'd have to wait; he didn't want to set her off again. "Come on, we'd better get back before you catch a chill or Marian will have my head." "Did Marian tell you what made me hysterical?" "She said you had suddenly felt completely isolated." "Yes. Never in all my life have I felt so completely alone as I did today. You know I've always felt the presences of other people, like background noise, constantly, everywhere. And when Zelda and the others... died, the silence in my mind-- it was frightening when Auron's "voice" fell silent... but I was on Liberator and, I found could hear you and Dayna and Tarrant and Vila when I listened hard-- not thoughts, mind you, just your presences, surface emotions. And it helped. I knew I still had a home, a family... and I rely on-- today I couldn't hear anyone. Nothing. It was the most frightening feeling I have ever experienced. Even though you were next to me, I couldn't sense you." "Yes. I can sense your presence now and I knew you were near before you knocked on my door tonight. And I can sense the presences of Marian and the others. But I cannot sense anyone on Liberator. Avon, I'm afraid that Liberator has been destroyed." "Perhaps they're too far away?" "No. I should still sense them." "Did you notice when your sense returned?" "I only know it was there when I woke up." This was certainly something to think about. It was possible that Liberator had been destroyed, but then news like that traveled faster than anything. "We would have heard if anything had happened-- "
"But Liberator may have a problem. When you began to feel isolated, did you try to teleport?" "Yes, I did. But I couldn't raise the ship." "There was a field of interference which prevented us from teleporting and it was also interfering with Barram's communications frequencies. The source of the field was traced to the shuttle we were using... and that shuttle is, very probably, now aboard Liberator." "If it's causing interference they'll easily trace the source and eliminate it-- won't they?" "Your problem? I think so." "That would be a relief." Georgie saw them from the kitchen. "What are you two doing up at this hour?" she demanded as she met them at the door. "I couldn't sleep and Avon was keeping me company." "And walking in the garden barefoot-- you'll be lucky if you don't catch a chill. Come inside," she said, shepherding them into the kitchen. "Now then, I was just thinking about what to have for breakfast-- "
"Breakfast?" Cally asked, "At this hour?" Georgie laughed. "I never needed much sleep before," she said, touching the great roundness of her belly, "and now I need even less. As long as I'm up, I have to have something to do. Now what would you like for breakfast?" "Anything. Anything will be fine," Cally said. "Anything. You're no help. Galen?" Avon was still thinking about Liberator's problems. "Mmmm... Yes?" He said, looking from one to the other trying to pick up the thread of the conversation. "You were a million miles away," Georgie observed. "I just asked you if there is anything you particularly like for breakfast." "Anything. Anything will be fine." "Two of a kind," Georgie laughed, shaking her head. "Off to bed with you now or breakfast will come too early for enjoyment. Go on," she said shooing them out, "get some sleep." "Good night, Georgie," Cally said and Avon followed Cally out of the kitchen, back to their rooms. Her room was closer and as he walked past her she called softly after him, "Sleep well." Dayna watched the screen. Instruments showed the position more clearly-- even at Zen's highest magnification there wasn't anything to see but a small spot of light-- but she felt more comfortable when she could see her enemy. There had been no change in position relative to Liberator in the hour and fifty minutes since Zen had drawn the blip to her attention. She thought about ordering a course change, to see if it would change course also, but decided against it: no sense in betraying knowledge of its existence unnecessarily. She watched for another ten minutes and then it was time to awaken Tarrant. "Sleepyhead," she laughed when he finally answered, "I called you twice." "I must be getting old." "I'd have let you sleep, grandfather, but we seem to have picked up a shadow." "When did you spot it?" he asked, sounding more awake. "Two hours ago. It's at the very edge of our detection range. It isn't gaining on us, but... I think you should take a look." "It's probably nothing. I'll be there in a few minutes." "Good. Bring some breakfast with you. I'm famished." They ate breakfast watching the viewscreen. Afterwards Tarrant initiated a gradual change in course and speed and they sat back to see what would happen.